Request the Council of Ministers to prioritize and address the Sanitary Landfill (aka The Dump) on Pond Island in Philipsburg, St. Maarten NOW! We, concerned residents of St. Maarten (hereinafter referred to as “Residents”), would like to ask your attention for the below. The Sanitary Landfill on Pond Island, Philipsburg St. Maarten (also referred to by many as “The Dump”) has reached its economic lifespan several years ago as confirmed by previous Ministers in Parliament meetings. Despite this fact, garbage continues to be dumped on this area over exceeding the limitations of the site. The Sanitary Landfill can be seen smoldering (because it’s ‘burning’ below the top surface) on most days of the year and by doing so the toxic smoke it emits is a health hazard to both residents and visitors of St. Maarten on a continual basis, not only when big fires occur of which the recent occurred on April 15, 2016. 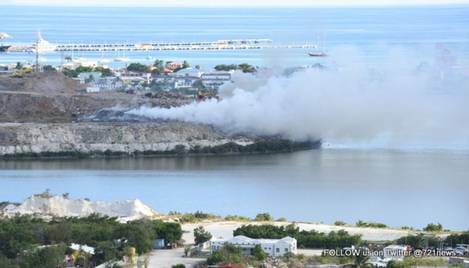 The toxic smoke emitted by the Sanitary Landfill is not only affecting residents ‘down-wind’ of the immediate surroundings of the site but can also be smelled many miles away and during large fires even as far as ‘over the hill’ (Cole Bay, Simpson Bay area). The conclusion is that the Sanitary Landfill is affecting the health of residents in many districts of St. Maarten. Apart from the Sanitary Landfill being a health hazard for residents and visitors on a continual basis, it has grown to become a very large hill of undocumented garbage in the center of a densely populated Philipsburg area. The constant threat of possible large explosions with extensive collateral damage which cannot be ruled out (as there is no actual record of what materials have been dump and their respective volumes), is a public safety issue. The location of the Sanitary Landfill in the center of the Philipsburg area is also not an ideal image for residents and visitors, the latter being St. Maarten’s only revenue source. The Sanitary Landfill also goes against the Constitution of St. Maarten as Article 21 states that “the “Government shall take steps to promote public heath” and Article 22 states “It shall be the constant concern of the Government to keep the country habitable and to protect and improve the natural environment and the welfare of animals”. Government’s failure to properly resolve the situation at the Sanitary Landfill is in breach of the Constitution of St. Maarten, because with every day, and with every fire, the country becomes uninhabitable. 2. Issue and communicate a deadline as to when a solution to the Sanitary Landfill problem can be expected. 3. Issue an instruction, including a deadline for project completion, to the relevant Government Department(s) to execute the project that tackles the Sanitary Landfill problem. We thank you for your time and attention to this urgent problem facing many residents of St. Maarten.